I bought this vintage pine cupboard approx. 16 years ago for $2 at a yard sale! I’m getting ready to paint it a deep shade of red – with a cream color on the inside. I like to use it to display lots of dishes in my dinning room. I think the deep red will bring some needed color to this section of the cottage. I’ll post a new picture when I finish the painting job. Don’t you just love pine country cupboards (especially for $2 bucks!) 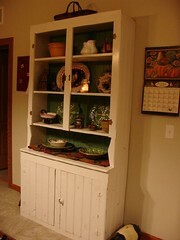 If you’re trying to bring some warmth & history into your home simply add a pine cupboard! No matter what the weather is like outside (it’s been raining here for several days), you can always find comfort in a cozy place to sit, read, and meditate on the issues of the day. I thought I would show you my favorite place to get comfortable in our home. This sofa was one that I had my eye on for quite some time. I first saw this piece when my friend took me with her to visit an upscale furniture store. They had so many great pieces that I think I fell in love with several 🙂 This cottage style sofa was one of the pieces in the front showroom. When I saw it, I knew that it was just the type of sofa that I would love to have in our new home, but the price was out of reach for what I wanted to spend on one piece. Needless to say – that week I found myself relaxing in my new cozy sofa, enjoying a good magazine & a hot cup of vanilla tea. I love the feeling that you get when surrounded by the warmth of the “old world” colors. We use many shades of red, mustard, cream, blue, green, – and of course – always a good dose of black in the different rooms of our home. 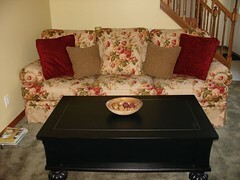 The black coffee table is nice and big – wonderful for putting your feet up at the end of a long day. The wooden bowl is an antique butter bowl that I bought at an auction for $1.